On my second trip to France my daughter, my friend and I traveled to Pont-Aven, a beautiful, sleepy little town located on the Aven River in southern Brittany. It is best known for the École de Pont-Aven, a group of artists, including Paul Gauguin, who frequented the area during the second half of the 19th century. 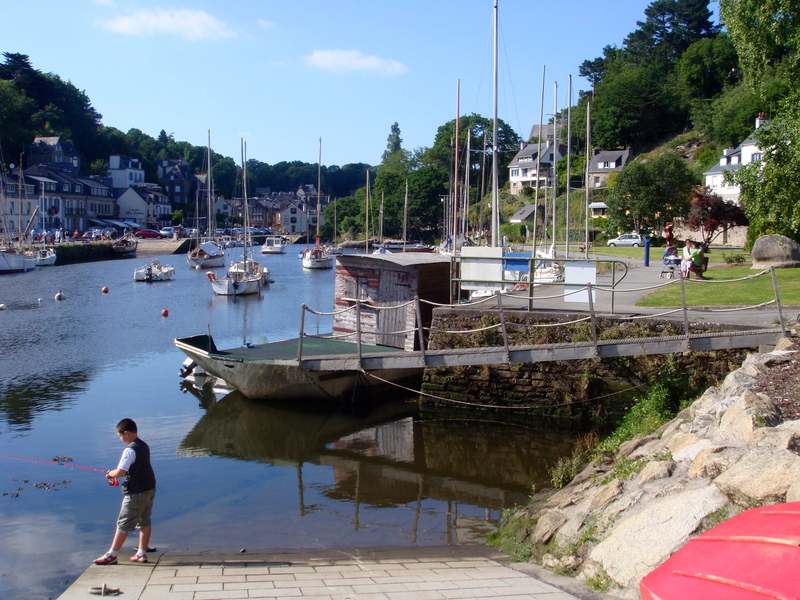 The area is stunningly beautiful and the ebb and flow of the tidal estuary adds to the raw natural charm of the town. When I think of Pont-Aven I think of strong, vibrant colors. Everywhere one looks, from the flowers, to the boats and the houses; all are bathed in bold, bright colors. The town of Pont-Aven is bisected by the river, but has many pathways and pedestrian bridges. It is extremely walk able with the terrain becoming steeper as you travel up from the river. One place we wished to visit was the Tremolo Chapel, the inspiration for Gauguin’s “Yellow Christ,” and for that we needed to drive a few miles outside town and up a very plain country road (though I do remember there being hiking paths from the town to the chapel). 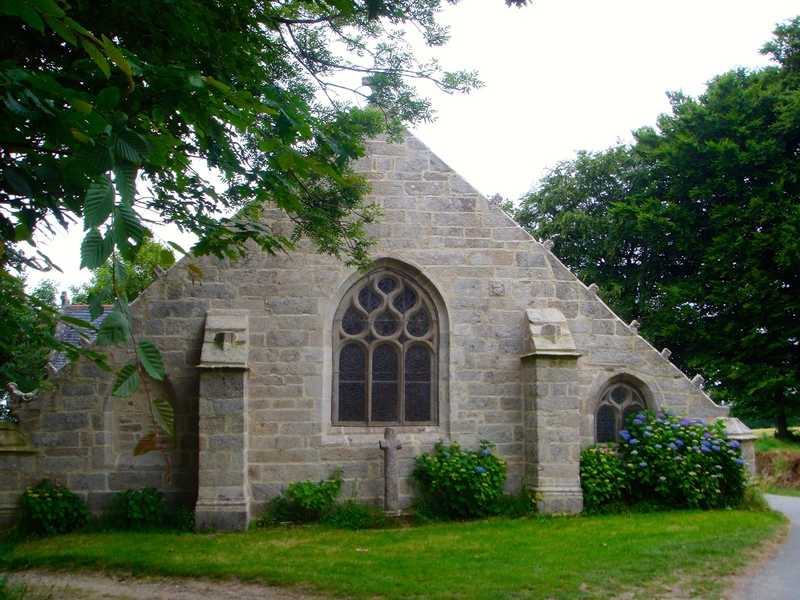 The 16th century chapel is situated halfway up a hill with farmland above and a home below. The view was outstanding. The little chapel was incredibly charming and I continue to kick myself for not taking more photos of the exterior, though I’m sure it was because I was just floored by its simple beauty. The chapel was rather dark inside and hard to successfully photograph. Besides the wooden yellow Christ cross, it has three wooden altars with carvings of figures that represent the seven deadly sins, as well as carvings on several of the ceiling cross beams. It also contains very simple, but beautiful, stained glass windows. Apparently, concerts are sometimes held in the chapel. How wonderful to be able to attend one! The beautiful landscape outside the chapel enhances the interesting building and historic woodcarvings on the inside. 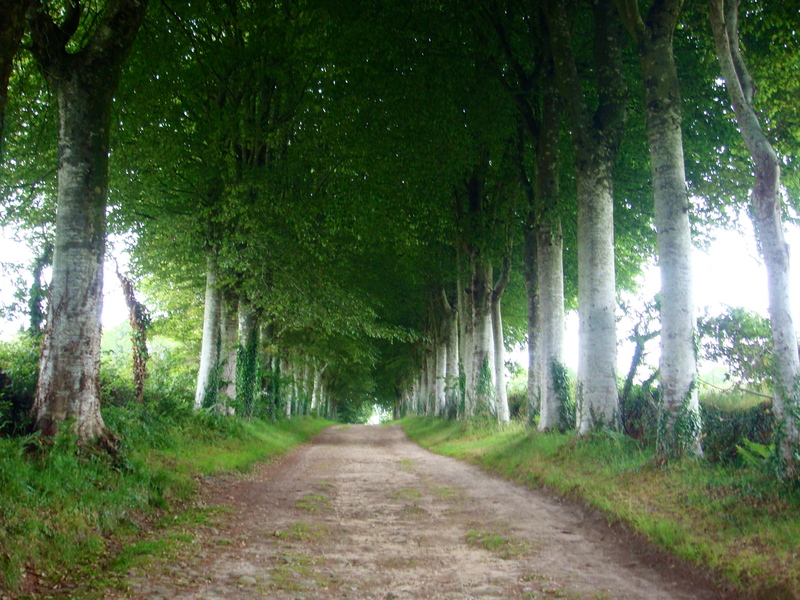 The drive continues past the chapel and up the hill under a stunning canopy of trees. A few miles south of Pont-Aven the river meets the Atlantic Ocean and the boat tour we took downriver was absolutely fabulous. I would love to go back and kayak the river one day (I’d love to kayak just about ANY river in France). We stood on the back of the boat for better visibility since the front was covered. You will see that many of my photos were taken of the area behind us across the wake of the boat. There is a path that runs on either side down the river, though I am not sure how far. There are some gorgeous homes overlooking the river. I’d love to know the stories behind each of these houses. Besides beautiful homes on steep hills, we also passed farms and pastureland. 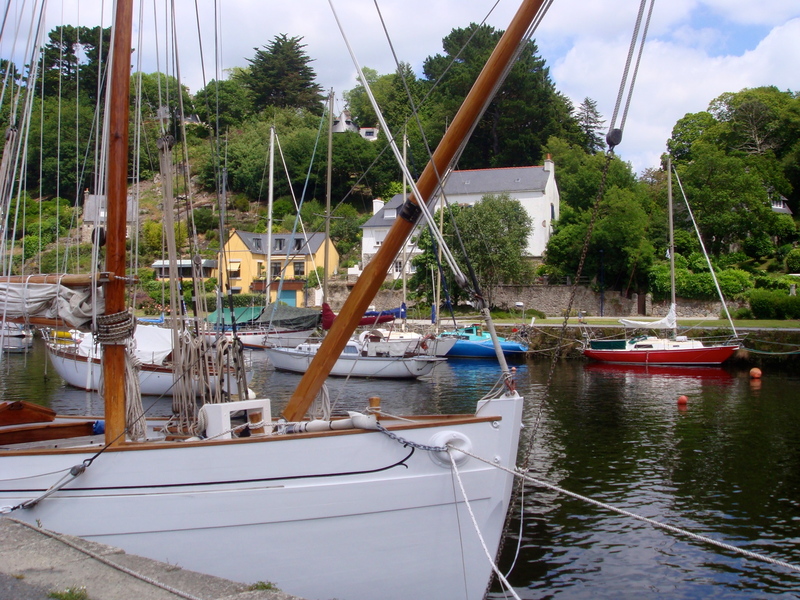 The trip down from Pont-Aven to the Atlantic Ocean is approximately eight kilometers, and at the mouth of the river there was what appeared to be a sailing school in action. As we headed back up river towards Pont-Aven we pass the beautiful home with the lush, terraced gardens I had photographed earlier. 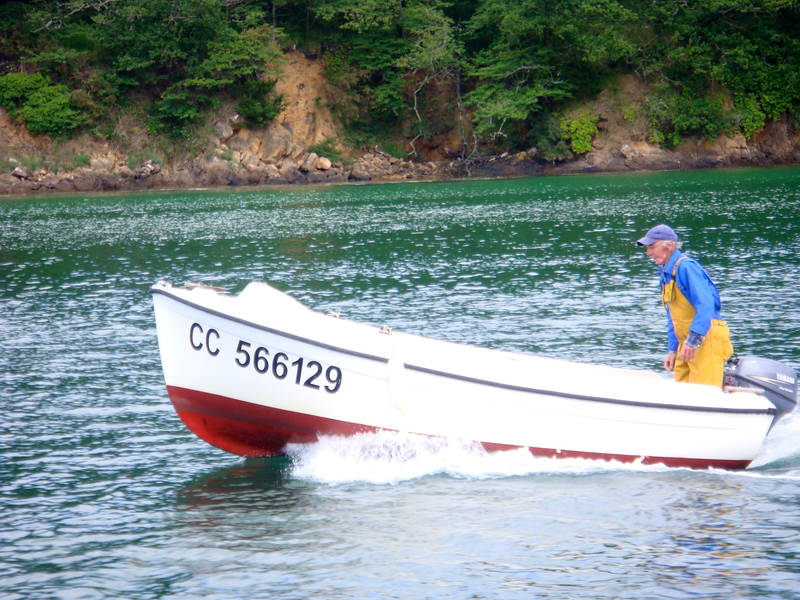 and a fisherman rode alongside us for awhile. I hope to return to picturesque Pont-Aven some day very soon. This entry was posted in France and tagged brittany, france, Gauguin, pont_aven. Bookmark the permalink.